Vivienne Tam, prominent fashion designer and Mandarin Oriental ‘fan’, joined João Manuel Costa Antunes, Director of Macau’s Government Tourist Office and senior executives from Mandarin Oriental Hotel Group, Hongkong Land and Shun Tak Holdings on June 29, 2010 at a colourful ceremony and ribbon cutting to mark the opening of the stunning new 213-room Mandarin Oriental, Macau. A festive lion dance and fire crackers were followed by private guest tours of the hotel and a celebratory dine around experience at the hotel’s chic restaurant and bar, Vida Rica. Mandarin Oriental, Macau is the most luxurious and stylish hotel in the enclave with panoramic views of Taipa Island, Nam Van Lake, Macau Tower and the hills of the South China coastline. The hotel has a holistic Spa at Mandarin Oriental, a comprehensive fitness centre, temperature controlled outdoor swimming pool, a range of stylish event space and the vibrant Vida Rica restaurant and bar, which is set to be the place to ‘see and be seen’. 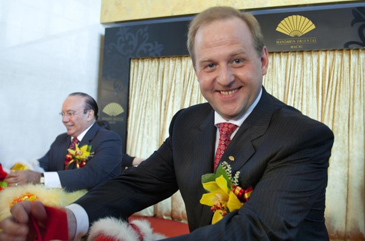 João Manuel Costa Antunes, Director of Macau’s Government Tourist Office and Martin Schnider, General Manager of Mandarin Oriental, Macau tie the ribbon on the lion at the opening of all new Mandarin Oriental, Macau. 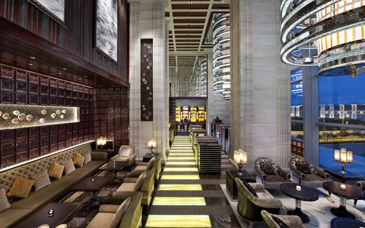 The hotel’s opening package rates start from HKD2,188 per night. This includes one complimentary consecutive night’s accommodation or a dining or spa credit valued at MOP388. Reservations can be made through Mandarin Oriental Hotel Group’s on-line reservations service at www.mandarinoriental.com or by contacting the Group’s worldwide sales and reservation offices, or by phoning Mandarin Oriental, Macau directly on +853 8805 8822, or e-mailing momac-reservations@mohg.com. 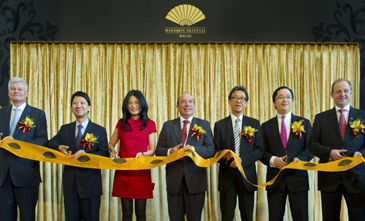 From left to right: Andrew Hirst, Mandarin Oriental Hotel Group’s Operations Director, Asia Y K Pang, chief executive of Hongkong Land Ltd.; Vivienne Tam, João Manuel Costa Antunes, Director of Macau’s Government Tourist Office, David Shum, Executive Director of Shun Tak Holdings, Raymond Chow, Executive Director Commercial Property, Hongkong Land Ltd and the hotel’s General Manager, Martin Schnider. They all cut the ribbon to declare the 213-room property officially open. Mandarin Oriental, Macau is ideally situated in the heart of Macau’s business, entertainment and high-end retail districts, offering easy access to all major tourist sites and transport hubs. Both Macau International Airport and the Macau-China border are 10 minutes by car, while the Hong Kong-Macau ferry terminal is just a short five-minute drive away. From here, Hong Kong’s airport can be directly accessed by ferry in 45 minutes and Central Hong Kong in just one hour. Mandarin Oriental Hotel Group is the award-winning owner and operator of some of the world's most prestigious hotels, resorts and residences. Mandarin Oriental now operates, or has under development, 42 hotels representing over 10,000 rooms in 27 countries, with 17 hotels in Asia, 13 in The Americas and 12 in Europe, Middle East and North Africa. In addition, the Group operates, or has under development, 14 Residences at Mandarin Oriental, connected to the Group’s properties.